Confessions of a Star Wars lover: When I was little, Star Wars (what is known to some as the FIRST one which is really the fourth episode) played quite often on cable TV. The one thing that scared me more than anything has ever scared me-past or present-was that brief glimpse of the Tusken Raider standing over Luke making that horrible sound raising his pole above his head. Sometimes, I find that my life calls me to be a Tusken Raider…I admit, that when I find a really big stick, I do, on occasion, lift it above my head and give my very best Tusken Raider impersonation. I get mad when no one knows what I am doing. Ya’ll need to get your geek on. This pattern is for personal use only, and no selling of projects is allowed (unless, of course you have permissions from all those powers that be, and in that case you are my hero) . Adult (hat circumference 21.2”) This is just the pattern that fits my head so I use it when making hats-you can use whatever hat base pattern you want that fits your size-just do it all in the creamy or light brown color. 7. Repeat round 6 until hat is 7.5-8” in height (or desired height) when folded (from top to bottom) If you like, you can add a sc row around bottom for a finished edge. 3. Repeat round 2; 29 more times or until your ear scarf measures 18.5 inches (or more or less depending on how long you want it-just be sure to make your second scarf the same length as your first. Finishing: After you finish your second ear scarf, sc around the edge of hat and ear scarves, putting 3 sc in the corner of each ear scarf to make a nice corner. Place a button (that is small enough to fit through a dc but large enough to not slip off a dc) on the last round of dc on hat. To attach the ear scarves, you should put one ear scarf corner onto button then place the other ear scarf corner onto other button. You can play around with placement of the ear scarves because you can use them to cover your face also, depending on how you place them on the buttons. 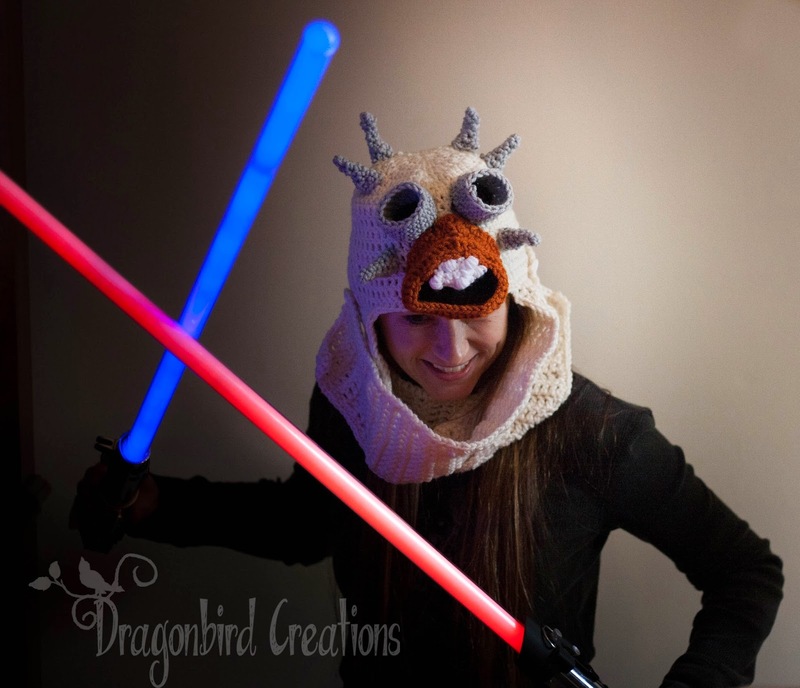 This is a very practical (as well as a geeky necessity) hat! 5. Sc around the edge of mouth, putting 3sc in the center of each corner. 4. (this last row will be the front of the mouth-round 1 is the part you will sew onto hat using photo for placement) Ch 2, BPDC around each sc. Join. Finish off, leaving long tail for sewing. Sew the ‘teeth’ onto the mouth part-but leave just a tad of the mouth part hanging over. Sew the three sides of the ‘teeth’ onto mouth looking at photo for a guide. 3. Ch1, *sc in next sc, 2 sc in next sc; repeat from * around; join (18 sc), finish off black. 7. Sc in 8 sc, finish off leaving tail for sewing. Look at photo for placement. Love it. :) Super creative! Thank you for sharing this pattern! I look forward to trying to make it. I want to say how awesome it is that you're sharing this pattern for free! I'm unable to crochet at the moment due to having rotator cuff surgery but I'm hoping I'll be able to resume crocheting after physical therapy & rehab is complete. I really want to try making this! Hello! I hope that you receive this message in time! I have made all the pieces made for this AWESOME hat for my husband as Christmas present, but I can't quite figure out where to place the black part of the mouth. Everything else is coming together great but I was hoping you could clarify this part for me. Thanks so much!! Makes total sense. Thanks so much!